Comment: When Jesus commissions the disciples, he sends them out with instructions and a promise. He has already spent his ministry teaching them, and he instructs them to go out into the world and teach everyone else what they learned from him. Then he promises that he will always be with them, to the end of the age. Even if he is not with them in body, he will be with them in Spirit as they go into the world. 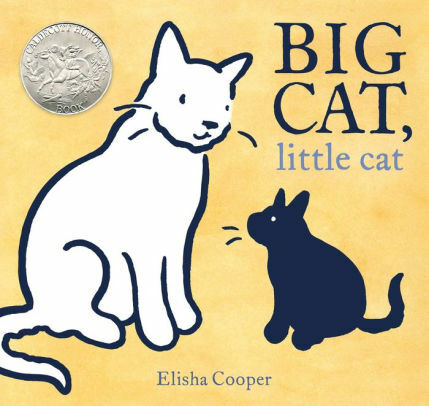 In Big Cat, Little Cat, a bigger, older cat meets a new, younger cat and teaches the little kitten how to be a cat: what to do, when to eat, when to rest, etc. But then the bigger cat, it says, “had to leave” and doesn’t come back—the big cat is old now, and its life is over. But the younger cat, now grown, takes up the mantle of responsibility. The younger cat remembers what the older cat taught and uses those lessons to teach a new kitten how to be a cat. The memories of what the older cat taught stay with the younger cat, so that the older cat’s spirit is with them as those lessons are passed on. Jesus taught the disciples and they went out to teach the same things all over the world, and so even when Jesus was gone in body, he was still with them in those lessons just like the older cat was still with the younger cat in the lessons they passed on. As disciples, we have the same commission: to go out into the world, teaching what we are taught, and as we do so, we carry the presence of those who taught us and of our Savior who is with us to the end of the age. Lectionary Links (NL): April 28, 2019 by Storypath is licensed under a Creative Commons Attribution-NonCommercial 4.0 International License.